Fratzioni Branca, Torre Calzolari, Spada, Padule, San Marco, Colpalombo, Carbonesca, Biscina, Belvedere, Scritto, Ponte D'assi, Cipolleto, Ferratelle, Semonte, Casamorcia, Raggio, Monteleto, Mocaiana, Monteluiano, San Martino in Colle, Loreto, Camporeggiano, Burano. information about each location here. 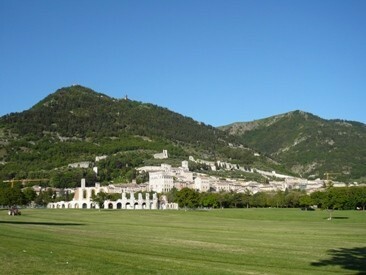 Today we went to Gubbio. As Marco promised, it was a beautiful ride through hilly country, more sparsely populated than other parts of Umbria, partly because of the many earthquakes (there is a named Gubbio Fault). We saw a small herd of Chianina cattle along the way. Huge, pretty things, with almond eyes. The enormous size isn't an illusion. We've had an equally large black half-Chianina steer at our county fair the last couple of years. Teatro Romano On our way into Gubbio, we passed a Roman amphitheatre, which is still used for music performances. On the largest map above, it lies in the lower left corner, shown as #26. Market Day When we got off our bus, we were greeted by a beautiful market array of vegetables and plants. 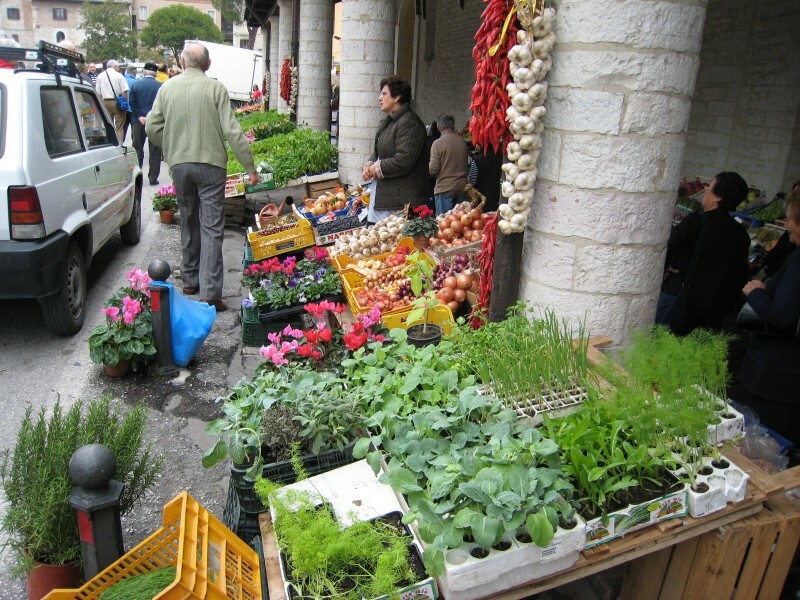 We later learned that the market was located at the Loggia dei Tiratori (#3 on the largest map above). This ancient place was the location of the Wool Corporation and built toward the end of the 5th Century. 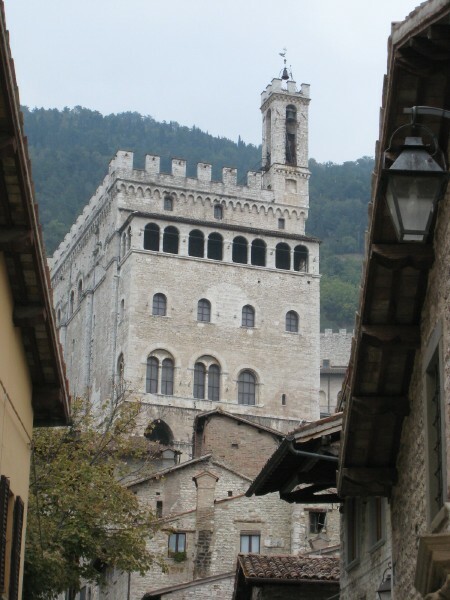 The building reflected the importance of wool in Gubbio, when the cloth produced was exported all over the world. The center of the Tiratori is an open gallery where, after having been dyed, the cloths were stretched in the sun. Palazzo dei Consoli Gubbio is a grey, stony town, immaculate, with pretty flower boxes and roses and some of the best cats we've seen. We climbed the via della Reppublica to the base of the Palazzo dei Consoli (#7 on the map). 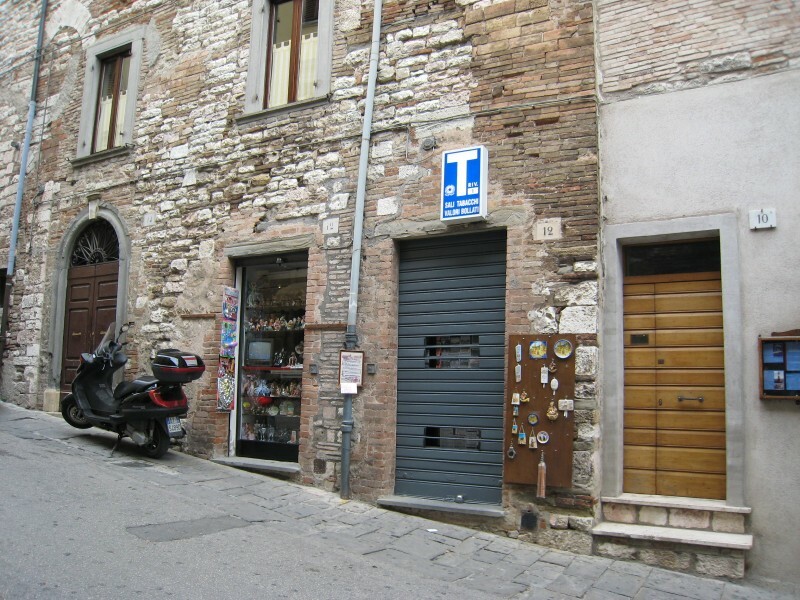 On the way Marco stopped in front of a "death door", on one of the side streets off to the right, raised above the street to facilitate removal of the casket (the room behind it served as mortuary -- people of Gubbio distrusted graveyards, which apparently were often ransacked). Fortunately, we were able to use the elevator (blue dot on the map) to get to top of the Palazzo. In the elevator, we were charmed by a little boy, about 20 months old. As we were waving hello/goodbye the boy said "arrivederci" and we all applauded. 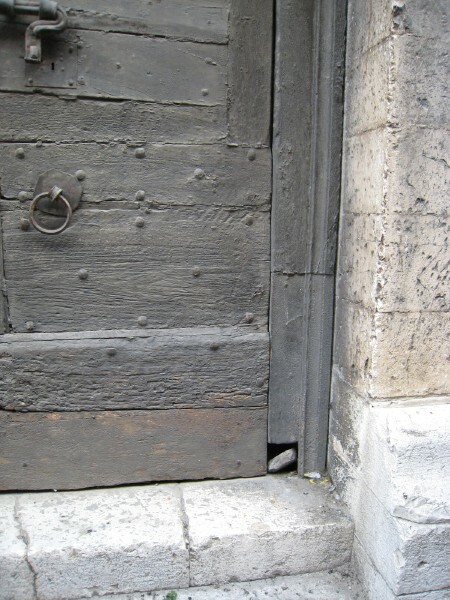 When we arrived on top Marco pointed out another door, the "gattaia" (cat door) in one of the massive doors of the Palazzo. 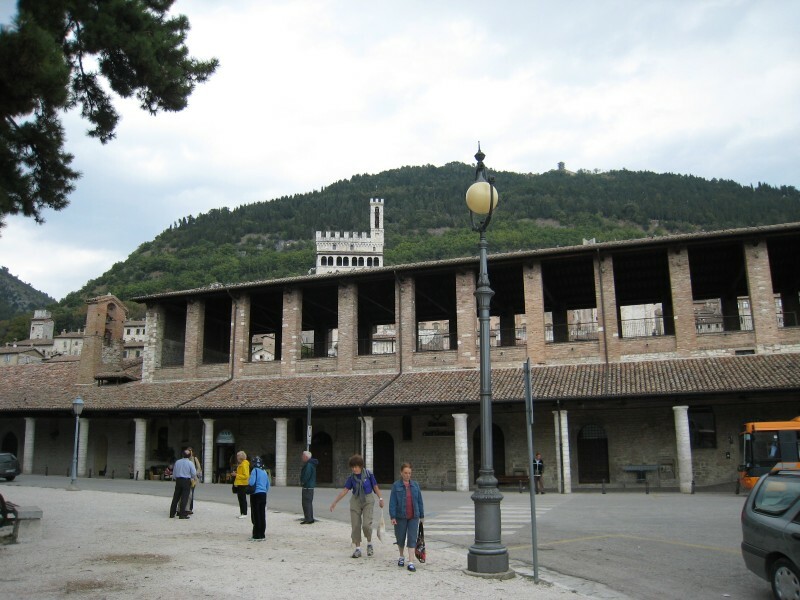 The building -- originally intended as a refuge for the important men of Gubbio in case of attack -- houses a sort of museum (the green circle above #8 on the map). I wasn't impressed. 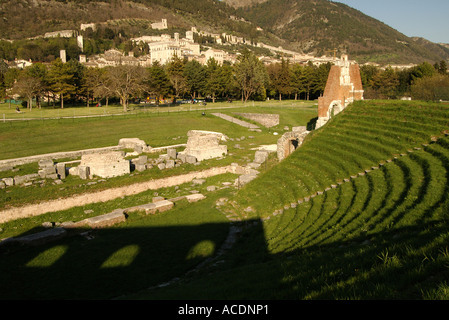 Also housed here are the Iguvine Tables, seven bronze tablets of different sizes, dating back to a period between 200 and 70 B.C., the first written in Umbrian and the later in Latin, whose script describes the complex religious rituals conducted by the priests in the ancient town of Ikuvium, present-day Gubbio. You can barely see it in the first photograph, but there's a tiny doorway on the top floor, far right, which has a little cage built around it. This was for housing any citizen whom the city fathers felt should be shamed. We tired of the museum and left early to do some exploring on our own. 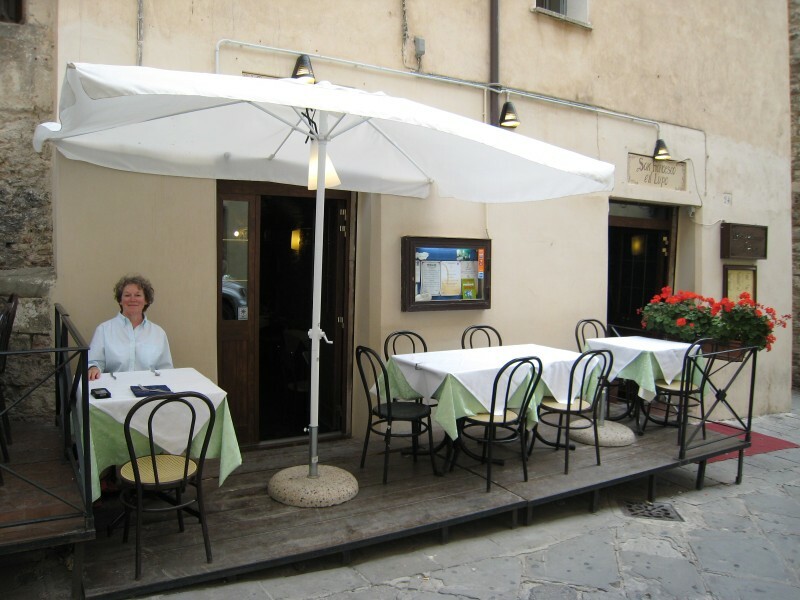 We found a restaurant which had been recommended in one of our guidebooks called "San Francesco il Lupo" (Via Cairoli,24, just off via Garibaldi) and had lunch there -- pasta called strangozzi (priest strangler), Karen's with cream and truffles and mine with the house sauce which was truly delicious. We shared a liter of house red. We sat outside in very cosy proximity to passing cars and buses. 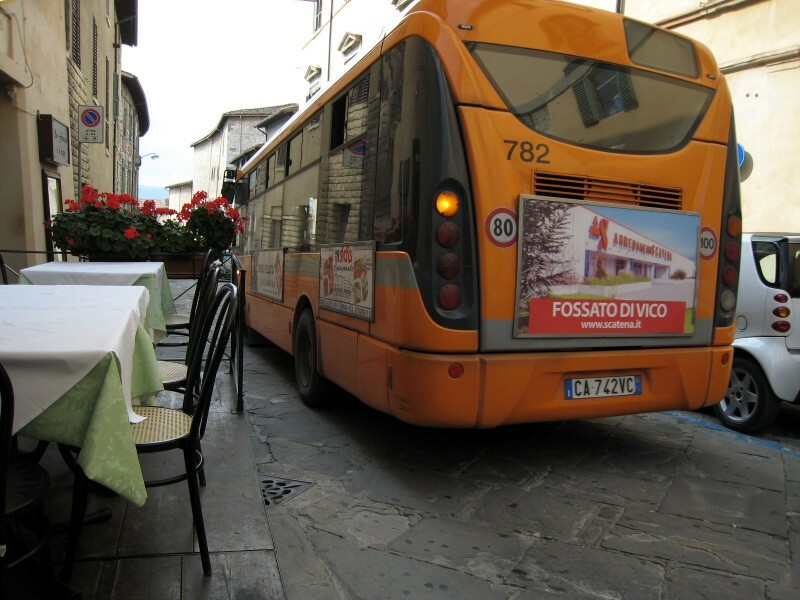 I couldn't afford to lean back in my chair -- just a few inches back and my chair would fall into the street; if I reached my elbow backwards a bus might hit it. The Gubbian Wolf Adventure Then we went in search of a statue of the wolf of Gubbio, made famous in Chapter 21 of Fioretti di San Francesco (Little Flowers of St. Francis}. 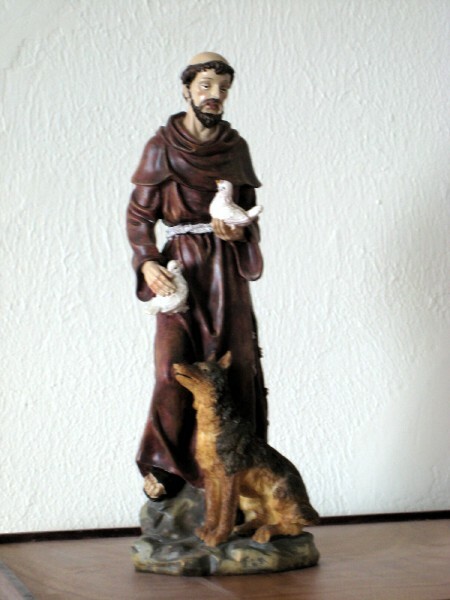 We stopped by a tabacchi, where we bought a St. Francis with doves on his arms and the wolf looking up adoringly. Francis might be preparing to feed those doves to the wolf. 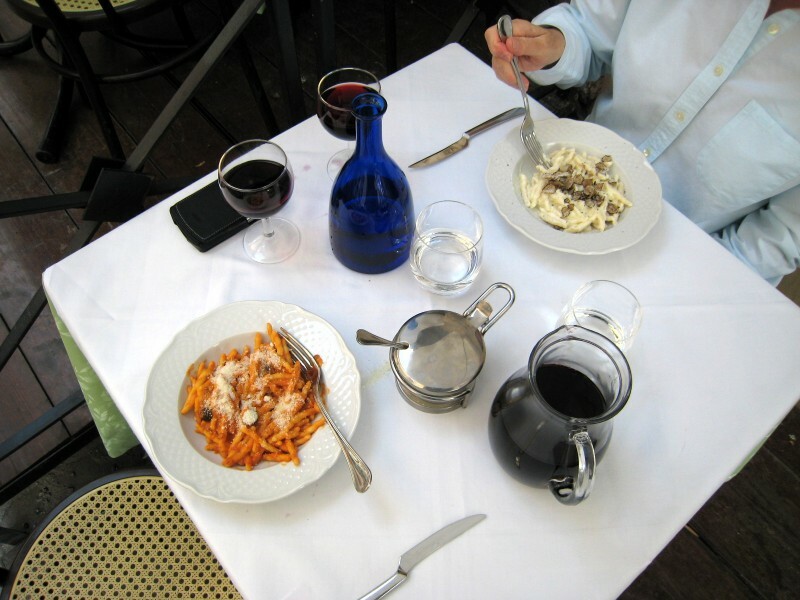 It's cornier than what we were looking for, but it fills the bill. While we were in the shop I got into an animated conversation, in Italian, with another customer who turned out to be a professore at the local university. We were talking about the benefits we shared by working for a state (rather than a Catholic) university. As it turned out the man behind the counter was also a professore. Much laughing and exclaiming. The only other person in the shop was a lady with a voice like Louis Armstrong. She talked a lot, too, but I had trouble understanding her. Whether she was a professoressa I couldn't tell. By the time I went back to get a picture of them all the shop was closed up for the two or three hour lunch break. 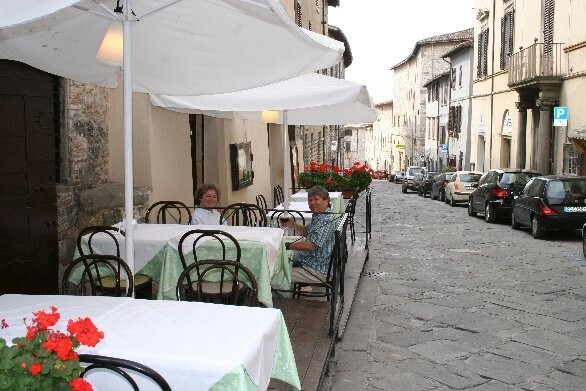 After that we walked down the hill (much easier than trudging up, I can tell you) and found ourselves at the Plaza of Forty Martyrs (Quaranta Martiri, above #1 on the map). 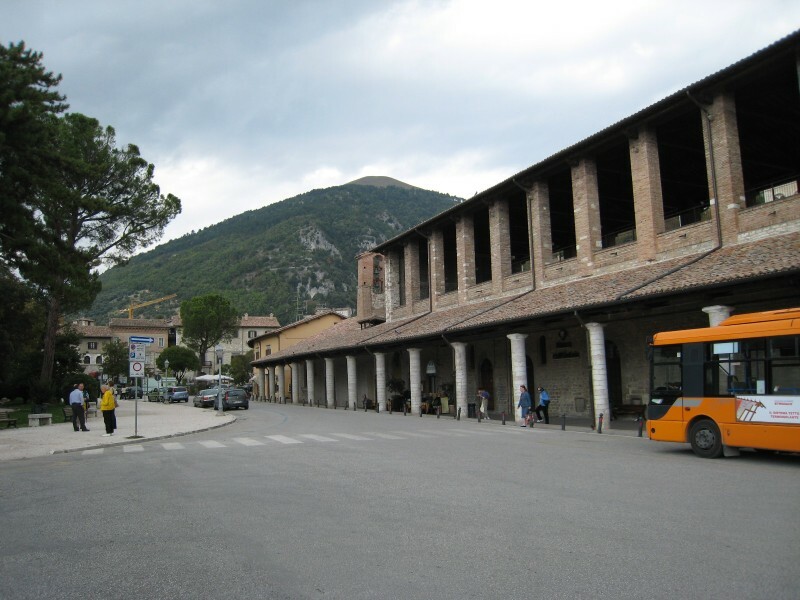 The forty were citizens of Gubbio whom the Nazis hauled into the square and shot in reprisal for partisan activities. 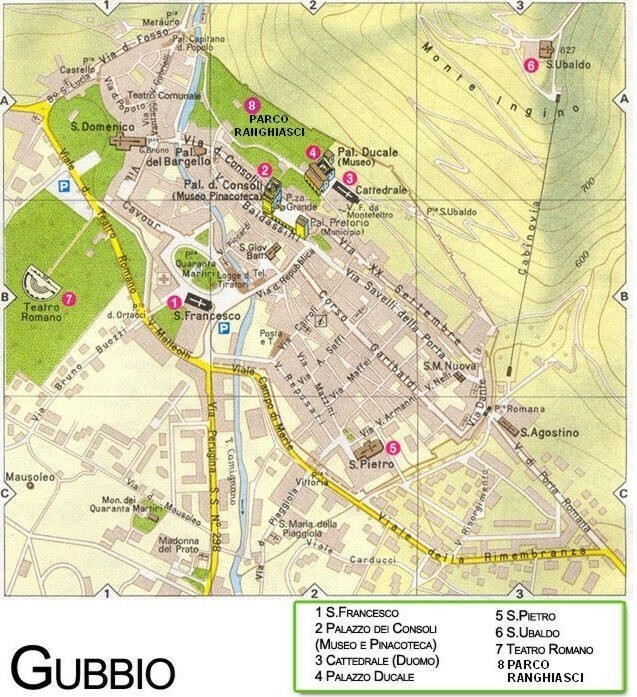 On the way down vi Reppublica we stopped by the tourist information office ("i" on the map) and picked up a very nice map of Gubbio (the one I've copied part of here). 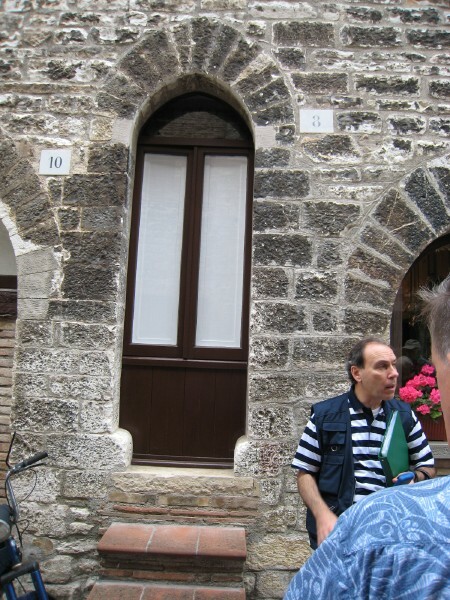 We also made use of the only public restrooms, behind the 13th century Church of San Giovanni Battista (#4 on the map). The weather had been cloudy and grey since morning. On our way back to Perugia we enjoyed some lovely sunshine, but could see a very dark weather front ahead. We kept an eye out for Chianinas, hoping to photograph them, but they seem to have known about that dark cloud, too, because they were nowhere to be seen. As we got about half-way to Perugia we were treated to bolt of lightning, clap of thunder and a thoroughly wet and noisy rainstorm, which we passed out of about 5 km from Perugia. We took naps and did a little exploring of the immediate neighborhood, which wasn't all that interesting. Had a pleasant dinner with Babette, Kayla Moser, and John and Roberta Barta.